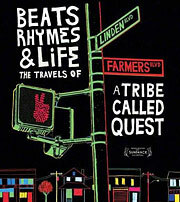 The GRAMMY Museum is proud to present one of the official selections of the 2011 Sundance Film Festival, 2011 Tribeca Film Festival, 2011 Los Angeles Film Festival and 2011 AFI-Discovery Channel Silverdocs Documentary Film Festivals, Beats, Rhymes & Life: The Travels of a Tribe Called Quest. Having forged a 20-year run as one of the most innovative and influential hip hop bands of all time, the Queens NY collective known as A Tribe Called Quest have kept a generation hungry for more of their groundbreaking music since their much publicized breakup in 1998. Actor/Director Michael Rapaport documents their inner workings and behind the scenes drama that continues to follow the band to this day. He explores what's next for, what many claim, are the pioneers of alternative rap. After the screening, Rapaport will take questions from the audience.